It is opposite the imposing city Gothic cathedral, within walking distance from the main shopping streets that Nicolas Adnet and Marc Hertrich have created their last hotel, opened last summer. 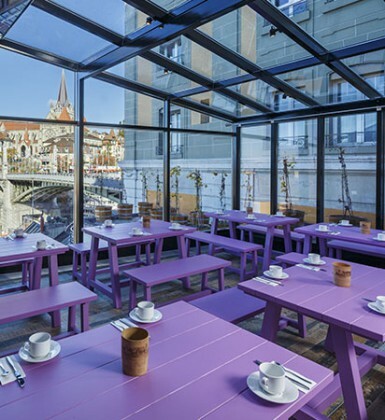 This place called Swiss Wine Hotel & Bar invites inside its walls in an oenological walk to discover the white wines of Lavaux at the counter of its Wine Bar. Throughout the 62 rooms (including family rooms with 3 beds and 4 beds) and common parts of the 3-stars hotel, the talented interior designers duo gave free rein to their imagination by emphasizing tangy colors: red, green, purple … We love the fully encased breakfast room with large windows offering a stunning spectacle of the Cathedral and the rooftops of the old town and the concave mirrors juxtaposed on one of the walls (red) of the same room. A fully equipped gym room completes the offer of this clever place. A. F.-M.